Early next year, the U.S. will move to new global model. The new model (FV-3) was developed at the NOAA Geophysical Fluid Dynamical Lab (GFDL) in Princeton and will replace the old Global Forecast System (GFS) model that has been around forever. 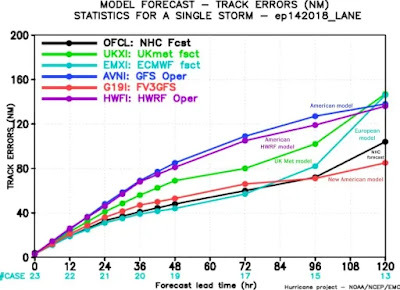 The new model is being run in parallel right now and fascinatingly, it is providing very different forecasts than the current system for Hurricane Florence, which is now approaching the SE U.S.. Which will be right? You will know in a week. But first, let me show you the amazing differences. Here is the forecast for 5 AM PDT September 14th of sea level pressure. Both have Hurricane Florence on the Carolina coast, by the differences in central pressure is HUGE! 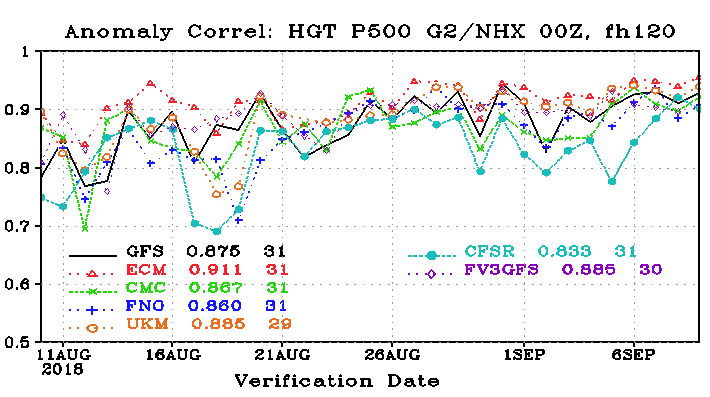 : 913 hPa for the old GFS, 979 hPa for the new FV-3. And the forecast two days later are stunningly difference. The GFS has a very deep low (913 hPa) hanging around on the coast, but the FV-3 has weakened and moved inland. 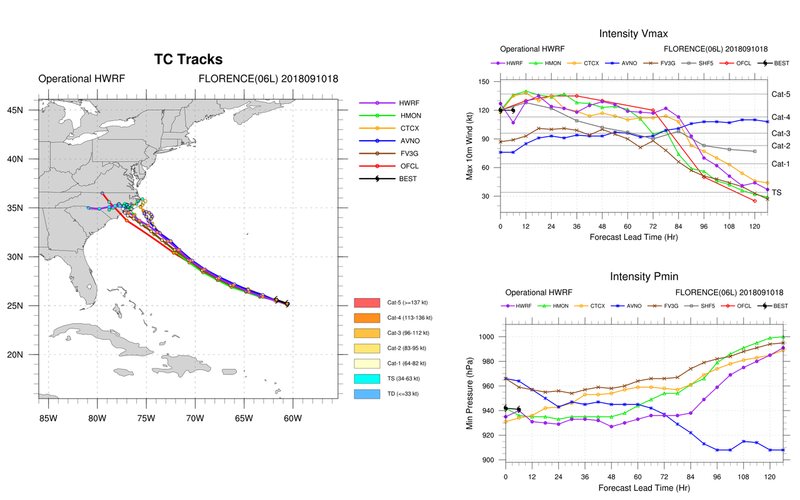 The track forecasts (see below--AVNO is the GFS, FV3G is the new model)) are initially similar, but near the coast, FV-3 swings farther south (bottom left) and the intensity forecasts are hugely different, with FV3 having weaker winds. Considering more general verification, here is a representative upper level (500 hPa, about 18,000 ft) for the five-day forecast (see below). The field below is anomaly correlation (1 is a perfect forecast) and you are looking at the verification of 500 hPa heights for the five day forecast. 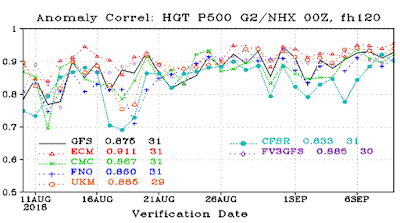 The European Center (ECM) is the best, but new model is tied for second place with the UKMET office. This is improved performance. Hurricanes are a big concern and the National Weather Service decided to replace the GFS after problems for Hurricane Sandy in 2012. Thus, a lot of eyes will be watching the performance for Florence. The implications of the differing forecasts for Florence are huge---the next few days should be interesting. Confusing. If we already know the European model is the "best", under what circumstances would we decide to use something else? At least the authorities in the Carolinas are not taking any chances with this one - mandatory evacuations for large swatches of areas. Sparking power lines are one of the leading causes of California's wildfires. SACRAMENTO (AP) — A California utility plans to replace 3,400 miles of overhead power lines with insulated wire to reduce the risk of them sparking when hit by tree limbs or other objects, the company announced Monday. Southern California Edison aims to replace the lines by 2025 to align itself with legislation that California lawmakers have sent to the governor to sign to prevent wildfires. Sparking power lines are one of the leading causes of California's wildfires. The wildfires have killed dozens of people and destroyed thousands of homes in recent years. The legislation sparked debate because it also will allow another utility company — Pacific Gas & Electric — to raise electric rates to cover the costs of lawsuits from last year's deadly wildfires amid fears it could go bankrupt otherwise. The bill also requires investor-owned utilities to safeguard their equipment to reduce the risk of fires. 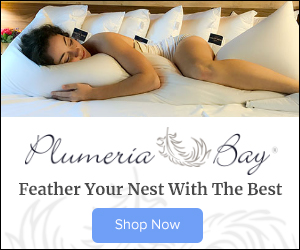 Southern California Edison said the insulated wire installation is part of a $582 million plan that would also be paid for in part by a rate increase. It includes removing trees and brush, installing cameras to help emergency crews assess a situation and respond quicker and adding weather stations so the utility can decide the safest way to operate if the risk of a fire is high. Fire investigators have blamed PG&E equipment for 12 of last year's wildfires in Northern California's wine country, including two that killed 15 people combined. Authorities have not determined fault for the Tubbs Fire, the most destructive in state history, which destroyed thousands of homes in Santa Rosa. PG&E is facing dozens of lawsuits from insurers, which have spent billions settling insurance claims from homeowners. Is the water Florence is traveling through at higher than normal temperatures? If yes, to what degree, pun intended after a second. From the perspective of a Wilmingtonian waiting for the games to begin, I hope FV3 is correct. I'll let you know. A very informative article. Obama paid for these new systems coming online. Just sayin. 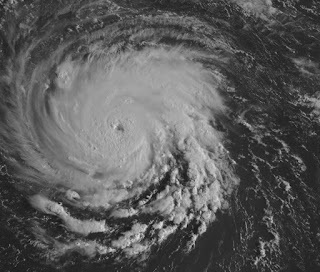 Cliff, WindyTY, which in the past has been pretty good, has it glancing the coast once near Wilmington , then going down the coast to make landfall again near Savannah. Any comments? 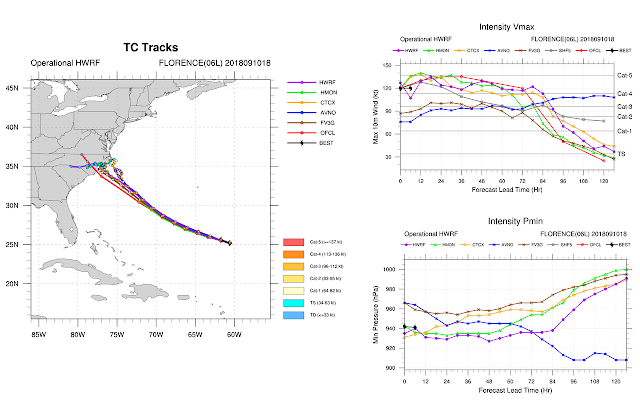 Richard Debois - yes, Florence is about to cross water that is much warmer than normal, not good. I'm already seeing claims of "compared to a world without climate change, Florence will have 50% heavier rainfall". I am not a climate change denier but some of these claims just seem ridiculous and inflated. I hope you write another blog about this topic, similar to what you you wrote last year after Harvey. 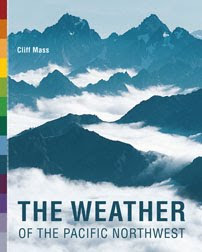 Cliff—why were the models so wrong abour this storm tiring south? Do any of these models incorporate the impact of common causes of variation vs special causes of variation? Why is autumn air so wonderful?